Who says it takes a ton of money to make money? For as little as a investment, you can start building a passive income stream with almost no effort. Just to be clear – the amount of income you are set to earn from a $5 investment may not be all that high. However, the point is that it doesn’t take much money to get started – which is probably the hardest part. For years, my wife and I have been building our main passive income stream … dividend stocks … one month at a time. We like to refer to our portfolio as the Money Sprout Index … which is a collection of stocks we own (over 30 and counting) that produce dividend income. At last check, our portfolio was set to earn $2,674.62 in 12 month future dividend income. That amount is not going to let us retire anytime soon … however it is a great source of passive income to build upon. The good thing is that we have been able to slowly build this source of income – one month at a time. With limited funds, we have taken advantage of new opportunities available to invest – at times for as little as $25 a trade. There are even opportunities for you to begin building your passive income stream with as little as $5 to $10! Check out the 5 steps below to get started on your path to financial independence today by investing in dividend paying stocks. 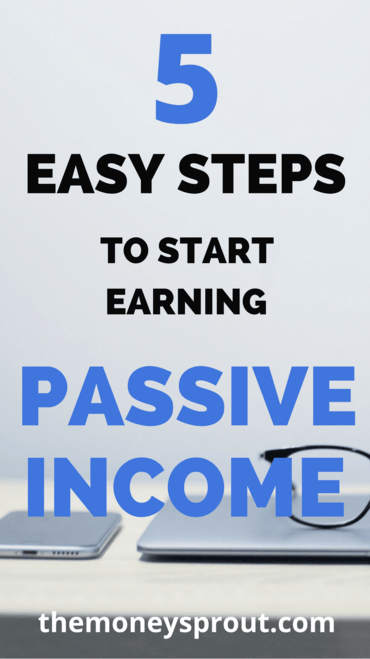 I have highlighted the 5 steps it will take you to start earning passive income with as little as $10 (or less). You certainly won’t earn a ton of passive income from $10, but you gotta start somewhere. The first step to start building your passive income stream is to find a zero commission broker … or at least a very low cost broker. Remember, we are talking about building an income stream with a small amount of cash – $10. Opening up an account with a brokerage like Fidelity that charges commissions will not work in this case. These brokers charge anywhere from $5 to over $10 a trade – which is most of our initial investment. The good news is that there are a couple low cost brokers that you can leverage. My wife and I have opened up accounts with a couple of these brokers (over the past 3 years) and have had success with several. The very first zero cost broker that we opened an account with was LOYAL3. This broker allowed investors to buy partial shares of stock with as little as $10! That’s right, we were able to invest small amounts of money into partial shares of Microsoft, Apple, and McDonald’s for as little as 10 bucks. Unfortunately LOYAL3 recently closed it’s doors, so we transferred all of our shares from that account into our Fidelity account. Over the years, we built up good positions in Target (TGT), WalMart (WMT), Microsoft (MSFT), and Apple (AAPL) just to name a few. We are not actively buying shares in any of these companies, so we are leveraging DRiP for these shares through our Fidelity account. The good news is that there are two other discount brokers (other than LOYAL3) that I highly recommend. Robinhood is a zero cost broker we have been using for over 2 years. The broker offers investors the opportunity to invest in all U.S. traded companies. There are no limitations on the list of stocks you can invest in through Robinhood. Even better … Robinhood does not charge you anything for trades! That’s right … you won’t pay any commissions on stocks you buy or sell from this account. The one downside of Robinhood is that you will likely need a lot more than $10 to get started. They don’t offer partial share purchases, so you will at least need to buy one share of stock. That shouldn’t be a big deal for most stocks if you have $100 or so to invest each month. The other broker that I would also recommend is Stockpile. This low cost broker charges $.99 per trade, which in reality is dirt cheap. Of course, it isn’t free like Robinhood … but it does have it’s advantages. First, the company only requires you to have a minimum trade of $5. I wouldn’t necessarily recommend that as you would be paying almost 20% in commission on that kind of trade ($.99 commission on $5 trade). But they do at least offer partial share trades, meaning you don’t have to have enough funds to buy 1 full share. This may be helpful if you don’t have the funds to buy a share of Apple (AAPL) for example. Another advantage of Stockpile is that they offer custodial accounts. For those of you with kids, this is huge! Each of our 3 children have custodial accounts setup through Stockpile and they are all building their future dividend income streams. Note – We personally won’t invest anything less than $200 a transaction through Stockpile. We try and keep our trading expenses below 0.5%. The next step is obvious but needs to be listed – funding your account. Depending on which broker you choose, you will likely need to link a checking account with your new broker. I have linked both our Robinhood and Stockpile accounts to one or more of our online checking accounts. Another option if you choose Stockpile is to fund your account from a credit card. However, I caution against buying stock by using a credit card as you will get a 3% added charge on top of your $0.99 commission. Remember … we are trying to limit our expenses as much as possible so we can use that money to invest in dividend producing assets. Despite it’s commissions, Stockpile can be a great tool to use to build your dividend income portfolio. Opening up and funding your account is the easy part. The next couple of steps is where things get trickier. The next step involves screening for top dividend stocks that you can hold for many years. There are many different screening methods for finding quality dividend stocks to invest in. For the Money Sprout Index, we use a set of criteria to narrow down potential candidates to add to our portfolio. At the beginning of every new month, I use an 8 step process to screen for dividend stocks. The criterion used to screen these stocks helps look for quality companies that have a long history of raising dividends. We consider several factors like – P/E ratio, dividend yield, payout ratio, dividend growth, and more. It is up to you to set your filter criteria and do your own research. However, a good place to start your research could be the list of Dividend Aristocrats (updated annually) or the Dividend Champions list (updated monthly). Note – It is also a good idea to define a set of rules to use on when to sell a dividend stock. Remember that the goal is to hold on to these stocks for a long time. However, there are times when you need to sell a dividend stock. For example, our exit strategy is to sell all our shares of a company if they announce a dividend cut. By far the most important step in all of this is to take action. Too many investors try and time the stock market and leave money sitting idle being lazy. Others tend to get influenced by the overall market and media and make poor decisions on when to buy and sell. The bottom line is that dividend investors don’t need to leave money waiting on the sidelines. If you are doing your due diligence in your stock screening process, then you should have confidence in putting your money to work. The last I checked, my savings account is earning under .50%. That is not going to build wealth. I would rather make logical investments in quality dividend paying companies sooner rather than later. We certainly don’t want to buy stocks that are way overvalued but a good screening process can help highlight those companies that may be fairly priced. Take action and start putting your dollars to work earning more dollars as soon as you can! Low cost brokers like Robinhood and Stockpile make all this possible since you are not being charged for commissions. The second most important step (once you buy your first income producing asset) is to keep the momentum moving in the right direction. Don’t stop at just your first investment. Follow a monthly plan to keep investing – even if it is $100 at a time (through Stockpile) or a single share of stock (using Robinhood). Like I mentioned before, over the course of 3 years my wife and I have accumulated over 80+ shares of Microsoft (MSFT) stock. At the time of this writing, those shares of MSFT stock will be responsible for $125+ in future dividend income. That is just in the next 12 months. As long as the company continues to grow their dividend each year, that annual income total above will rise with it. By developing a solid investment plan and taking action each month, you will not need to worry about the overall market ups and downs. Instead, focus on the long term growth of your portfolio and the future income that it will produce. It is just common sense that a $10 investment is not going to make you instantly rich. Even earning a modest 5% yield on $10 worth of stock will only bring in $.50 of income in a year. That doesn’t sound very appealing at all. Building a solid passive income stream from dividend stocks takes time and patience. Keep investing $10 each month ($120 per year) and your income shoots up to $6 per year. Still nothing spectacular, but once it starts earning compounding interest over the course of many years, your income can explode. All it takes is $10 (or less) to get started on your financial freedom journey. What is holding you back? What was the smallest amount of money you invested at one particular time? My wife and I have invested $25 many times through our old LOYAL3 account and realize every bit does count for the bigger picture.